Unravelling the mechanisms by which a cell adopts the correct fate in response to its local environment remains one of the fundamental goals of biological research. Skeletal muscle is a paradigm for the study of cellular commitment, differentiation and organogenesis during both embryogenesis and regeneration and repair in the adult. It has long been the subject of developmental studies because it is easily recognizable from an early stage, a factor vitally important prior to the advent of molecular markers. Moreover, the establishment of myogenic cell lines has allowed its biochemistry to be studied intensively for over 30 years. In the 1990s, the use of transgenesis, new cell labelling techniques and molecular markers allowed the merging of these two approaches to provide the basis of an understanding of the molecular embryology of the system. We are now entering a new phase, in which integration of molecular embryology, comparative genomics, functional genomics and studies of transcriptional regulation will result in precise understanding of the mechanisms of determination and differentiation in the embryo. 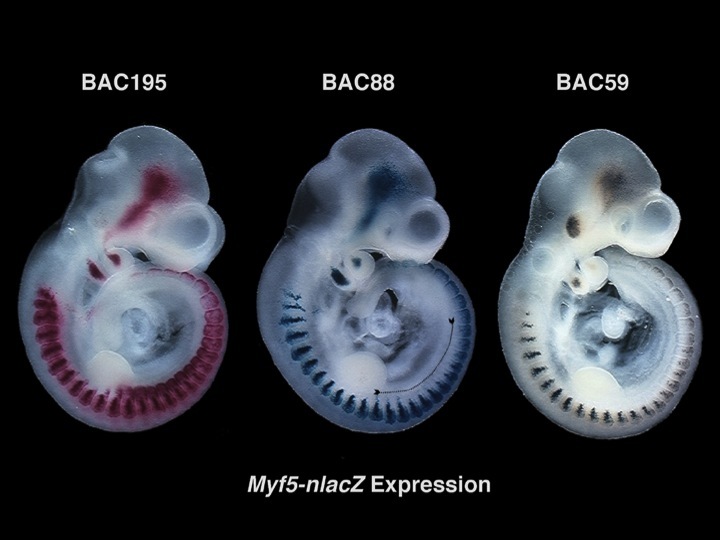 Skeletal myogenesis is initiated by the activation of the Mrf4/Myf5 locus which is expressed in multiple regions of the embryo in response to signals which are interpreted by an exceptionally complex array of regulatory elements. This triggers a cascade of transcription factors and downstream structural genes, ultimately resulting in the generation of one of the fundamental histotypes. Our work will provide specific answers to a number of outstanding questions in developmental biology, such an in-depth study of the molecular biology of craniofacial muscle development which has been little characterised in mammals, transcriptional regulation, including the full characterization of particular elements involved in crucial regulatory aspects of the locus and the analysis of a novel mechanism for regulating complex loci. Finally, understanding the upstream signalling systems will open the way to studies of molecular evolution and of regeneration and repair in the adult.